Takao Yoshida, left, president of Junkei-Glove, and his wife, Nahoko, produce baseball gloves in Miyake, Nara Prefecture. （The Yomiuri Shimbun October 27, 2018）　MIYAKE, Nara — The National High School Baseball Championship celebrated its 100th tournament this summer, and the winning teams of professional baseball’s Central and Pacific leagues have just been decided. As players take to the field and chase the white ball, they are supported by the craftsman of Miyake, Nara Prefecture. 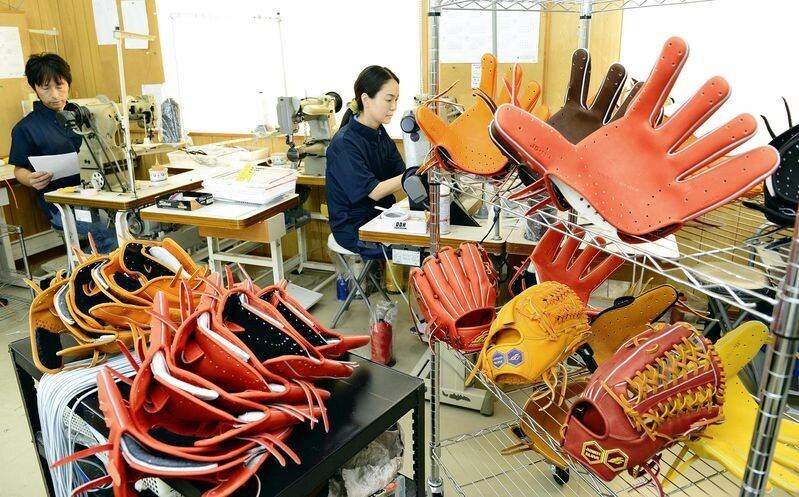 Nara Prefecture is said to account for about 80 percent of the nation’s production volume in baseball gloves, with Miyake as its production center, drawing on high-level skills developed over almost a century. Entering the workshop of Yoshikawa Kiyoshi Shoten, a baseball glove manufacturer established in 1952, I was welcomed by the smell of leather. Masahiko Yoshikawa, 60, the second-generation head of the company, was working with his two sons — Takamasa, 32, and Masatoshi, 30. Early models of baseball gloves made during the Taisho era (1912-26) are on display at the Miyake town government office. The craftspeople cut bull leather sheets and sew sections by machine before forming the parts for fingers with cylindrical irons. They then thread leather cords into the gloves and make the entire shape three-dimensional to complete the glove. Most of the process is done manually, allowing the production of up to 300 gloves per month.